Frog Cottage is perfect for large groups or families wanting more space. Upstairs has a large twin room.There's plenty of space to add another 2 temporary beds if needed. There isn't a kitchen but there is a fridge with table & chairs & we can provide you with crockery etc if you want to prepare yourselves cold meals. The freshest room in the place during the hot summer months! 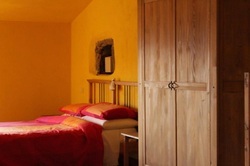 Downstairs there is a king size double room with ensuite shower room/w.c & another w.c. There is room for a temporary single bed as well. 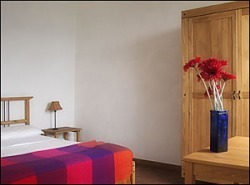 Chestnut Room is perfect for couples ....there's room for a child's bed or cot as well. 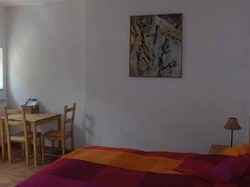 Cherry Room is perfect for families or a couple wanting that little bit more space. 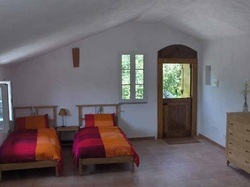 ...there is actually a double bed, bunk beds & room for an extra single bed so it'll sleep 5 if you need. 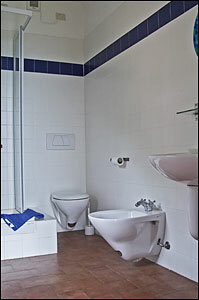 All of our Guest rooms' shower rooms are similar in design. We also have available on request a small double Room with private showerroom/wc or, at the bottom of our stone steps please check out The Priest's House....communal lounge and 2 ensuite rooms. You simply walk up the steps in the morning for breakfast on the terrace or to use the pool.